We have launched this page as we have recognized that as a company we are unable to help all the people looking to use our services. This page provides information to likeminded people who would appreciate owning and operating their own business, while enjoying the benefits of our trading experience and expertise. We are looking for hardworking and dedicated people to join us, working independently but closely with us to help develop our brand and field of operation. Please see the links on this page for more information and we very much hope that we hear from you in the very near future. To make an application please complete the online application form. Complete the Contact Form below, download the Prospectus and complete the online Franchise Application Form. We focus on one area, electric water heaters, and aim to provide the best service there is in this area. We believe that offering a dedicated service, carrying replacements parts in stock and getting out to calls quickly are important in winning clients' trust and meeting their needs. Being a specialist, we are constantly building up knowledge to ensure that the jobs done are both safe and reliable. Our reputation has been built on service, knowledge and reliability and it is this that encourages repeat business. We are very pleased with our success to date and look forward to developing our business through a franchise model in the future. Never forgetting how important reputation and continuity are to our brand, we have over time, carefully built a brand image that seems far bigger than we are. We will continue to protect its integrity and ensure its simplicity for sharing. We are perfectly placed right now to help a few local individuals realize a great business opportunity and enjoy the kind of success that we have enjoyed. Our next step is to find those individuals and introduce them to our franchise offering and team. 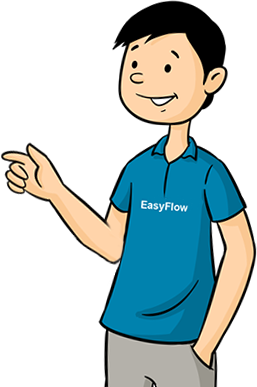 We know that there is an opportunity for at least one EasyFlow franchisee in each major city or urban conurbation across the UK. We are known in our local area for our outstanding service and first-class support. We understand what it takes to create success and enjoy the rewards that building a sound EasyFlow business can bring. Understanding the true potential of this business has enabled us to understand the kind of franchisees we are looking for. This is knowledge we want to share across our network for your success. You will be responsible for setting the pricing in your area. Experience has taught us clients react favourably to certain price bands which you can follow if you wish.